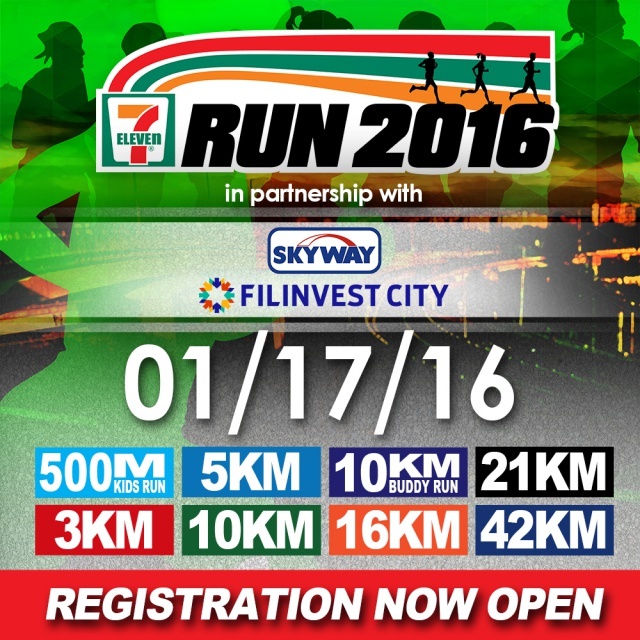 After a successful Run 800 in 2013, Run 1000 in 2014 and Run 1500 in 2015, 7-Eleven will be holding Run 2016 this coming January 17, 2016. Run 2016 once again will bring a massive and exciting marathon to every one of all ages, featuring the same categories as last year’s race. 7-Eleven is once again partnering with Skyway and Filinvest City as its official event venue. Get ready for a full blast marathon! Runners joining the 10km, 16km, 21km and 42km categories and 10km Buddy Run will enjoy the course set along the Skyway. Those joining the 500m, 3km and 5km categories can look forward to an organized race course along Filinvest City. 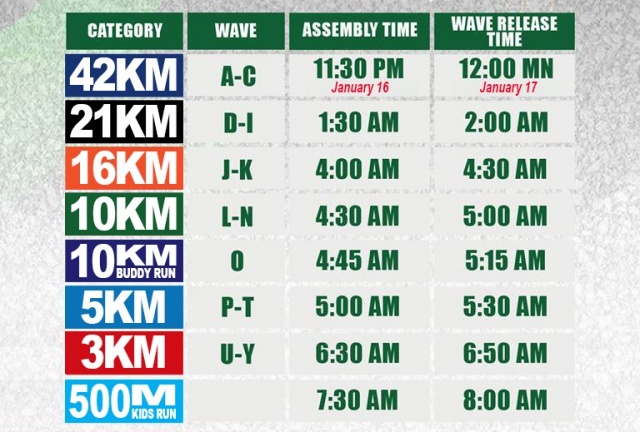 Run 2016 is made possible with 7-Eleven’s unique system of SELF-SELECTED WAVE STARTS. This enables the participants to choose their wave start and run with people with the same skill or speed (or with friends!). Top 3 category will receive cash prizes and medals. Top 3 Filipino males and females in the 21km and 42km categories will be sponsored by 7-Eleven to join an international marathon in Asia. To encourage more participants for this run, Top 3 groups (schools and companies or organizations) with the highest number of registrants will also receive a special trophy. Registration is now open! 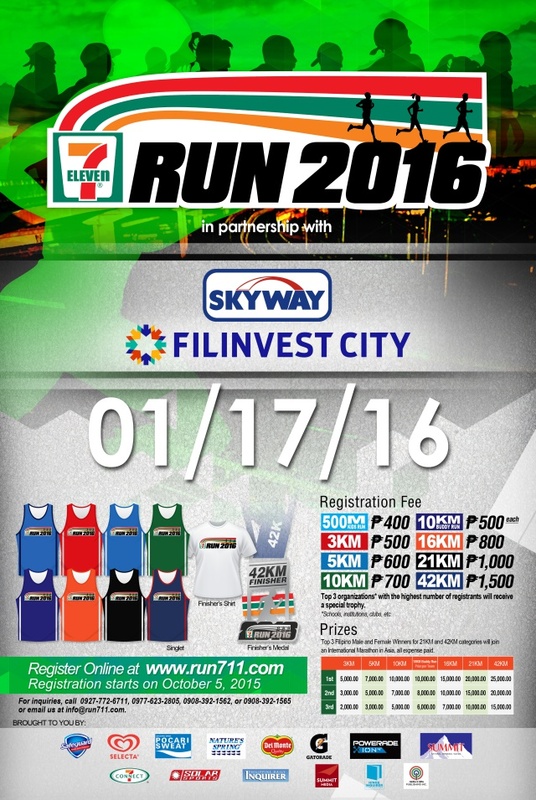 You may register online at http://www.run711.com until December 30, 2015. 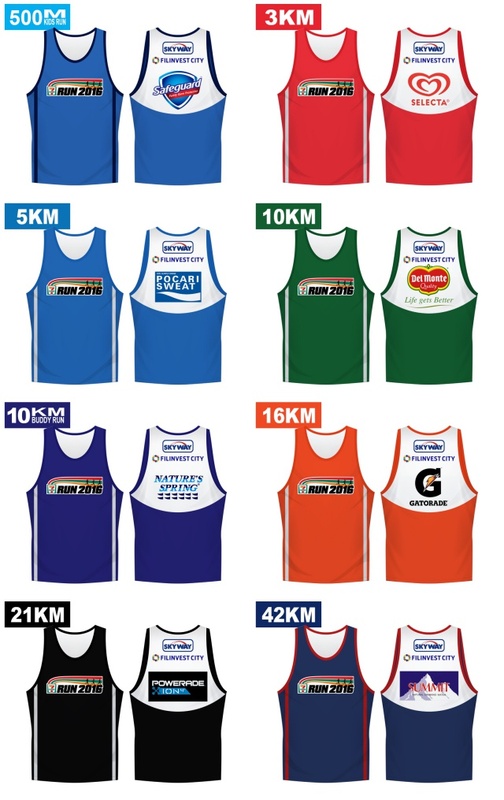 Race kits can be claimed on the date indicated on the receipt and from the same store where payment has been made. Gatorade, the world’s favorite sports drink, turned 50 years old this year! All set to pave the away to greatness, Gatorade lined-up two big events. First was the launch of its newest variant, the the orange-and-grapefruit-flavor based White Lightning together with its newest set of ambassadors who are among the top local athletes of this generation—UAAP volleyball superstars Alyssa Valdez from the Ateneo Lady Eagles and Mika Reyes from the De La Salle Lady Spikers together with basketball hotshots Chris Banchero of the Alaska Aces and Jeron Teng of the De La Salle Green Archers. The launch, which was held at the Gatorade Hoops Center, saw members of the media interacting with the ambassadors in a number of fitness activities. Participating media not only got a glimpse of, but also experienced how, off-court training is being done by these elite athletes. The winning group got to bring home prizes courtesy of not only Gatorade but also Toby’s, Adidas, Juju Eats and 360 Fitness Club. Gatorade believes that it begins with hard work—the kind with no shortcuts, the kind that’s relentless and that will make you ache and sweat. Whether the goal is to finish a 21K half marathon, climb a mountain peak, or just feel physically stronger overall, preparing yourself in the gym and constantly working to improve your game is key to winning on game day. And with this kind of hard work, proper hydration is crucial to be able to push forward and grow stronger. With a refreshing, light orange-grapefruit flavor, White Lightning is formulated with non-carbonated water that does not cause stomach discomfort; 6% carbohydrates which research has shown to be the optimal level in promoting absorption and providing energy to working muscles; electrolytes for rapid rehydration and minerals to help prevent cramps. Apart from this grand launch, Gatorade is finally making its debut in the country’s fast growing running circuit with the launch of the first ever Gatorade Run. 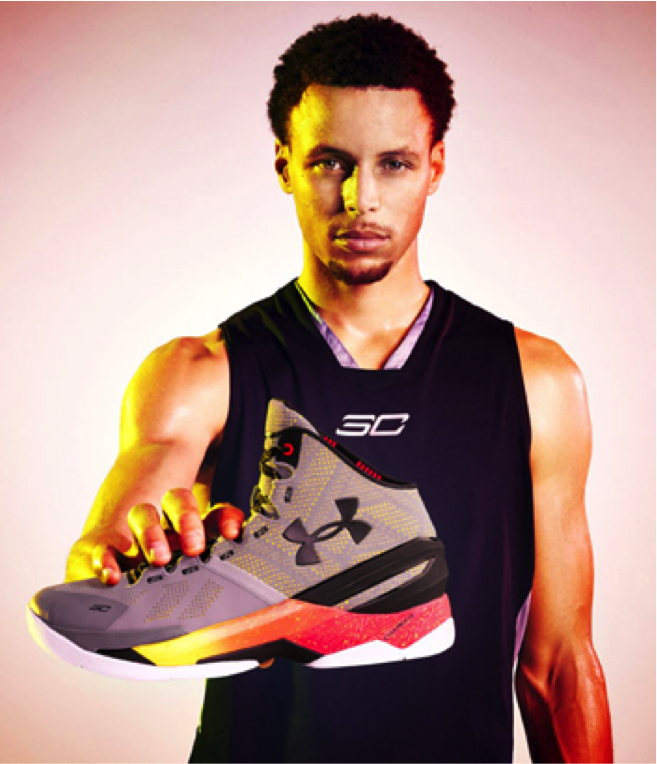 Following the recent short but successful visit of NBA’s Most Valuable Player Stephen Curry here in the Philippines last September, Under Armour happily announces the availability of the new CURRY TWO basketball shoes in Under Armour stores here in the Philippines. For more details, kindly check out the official press release below. Under Armour stores in the Philippines can be found in Bonifacio Global City, SM Megamall A and UP Town Center. 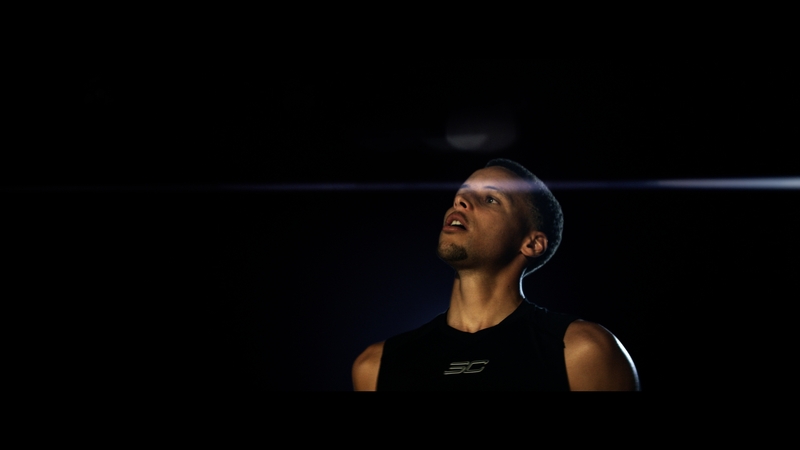 Philippines, 30 October2015–Global high-performance sports leader Under Armour, U.S. National Basketball Association (NBA) superstar Stephen Curry and actor Jamie Foxx team up again in a new campaign to launch the highly acclaimed Curry Two shoe from Under Armour. The first basketball shoe to feature a full-length Charged Cushioning midsole unit and a UA SpeedForm seamless upper, the Curry Two was first unveiled by Curry during his tour of Asia on the Under Armour Road Show on September 6 in Shanghai, China, and is now available at retail globally starting 24 October 2015. The spot features the “Iron Sharpens Iron” Curry Two, the lead colourway of Stephen’s second signature shoe. Inspired by Stephen’s relentless commitment and dedication to make his teammates better through his play and leadership, the “Iron Sharpens Iron” Curry Two features a grey upper with a back layer of yellow that pops through perforated patterning, as well as a midsole with orange to yellow fade that incorporates detailed speckles to represent the forging of metal. Stephen’s motto, “Make My Teammates Better,” serves as the foundation for how Stephen mentally approaches the game of basketball. His strength and fortitude serves as a source of strength for his teammates and the team. Additional colourways of the Curry Two will be released throughout the season. Created with a full-length Charged Cushioning midsole unit and a UA SpeedForm seamless upper, the Curry Two is engineered for basketball’s next great game changer. The full-length Charged Cushioning unit in the midsole absorbs impact and converts it into a responsive burst to enhance Stephen’s first step and change of direction. The UA SpeedForm Technology upper moulds precisely to Stephen’s foot, providing free range of motion and strategic stability so he can stop and go, cut and change speed without restrictions. 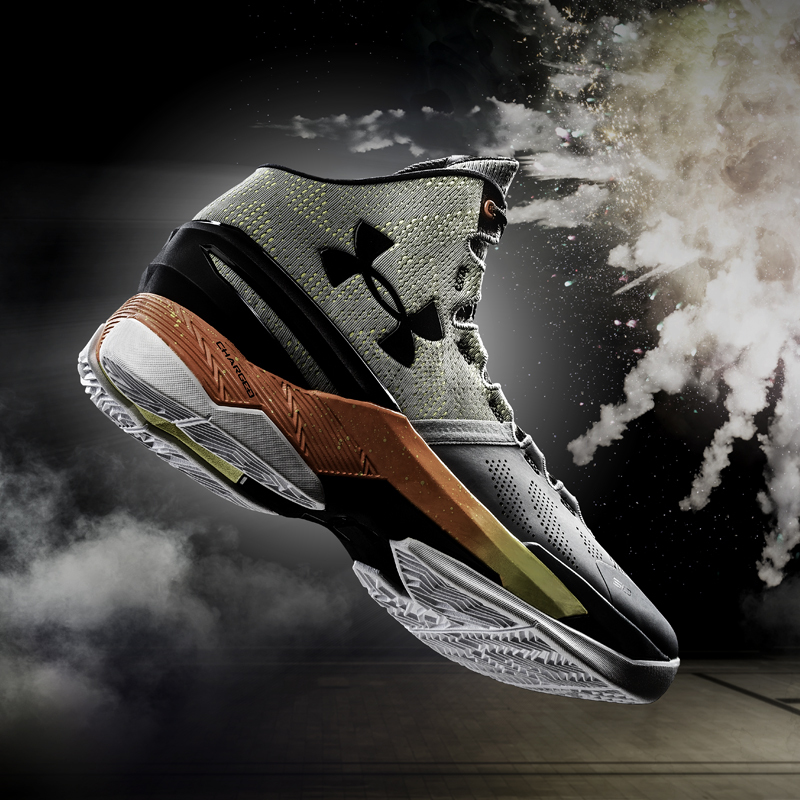 The perforated engineering in the UA SpeedForm keeps the Curry Two lightweight with durable breathability. The Curry Two’s external heel counter also locks in the foot and eliminates sliding for a secure fit. The rubber outsole with an organic herringbone traction pattern offers supreme underfoot control and multi-directional grip of the court. External shanks in the arch and forefoot provide midfoot and lateral stability. A high abrasion skin on the toe tip increases durability to support Stephen’s quickness and change of pace. Join in on the conversation by following@UABasketball on Twitter, Instagram and Facebook, @underarmourph on Instagram, and on Facebook at www.facebook.com/underarmoursea. Every woman’s heart long for a healthy and exceptional way of living. There’s no other way in making it but through how they manage their lifestyle. By being driven, strong, and fearless to accomplish any circumstances they may face, they can attain all those aspects to get ARMOURED and be EMPOWERED! It is in this light that the #WomenofWill of international sporting brand Under Armour, was born. Connected in a way to the brand’s “I Will What I Want” push, the Women of Will campaign aims to depict women and their declarations in overcoming doubt and setbacks related to their womanhood. 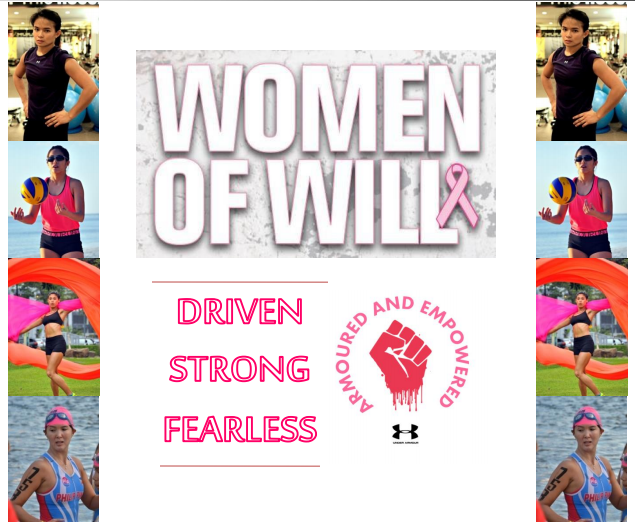 For the month of November, Under Armour gives emphasis to the #WomenofWill campaign via the “Women of Will Wednesdays” which is a series of Yoga sessions every Wednesdays at the Urban Ashram Yoga in BGC. With the PSGS Foundation as its beneficiary, the WOW Wednesdays is also in support for the Breast Cancer Awareness Month and in celebration for all #WomenofWill who uses the active lifestyle and sports in successfully fighting against breast cancer. How do you get the chance to join these weekly Yoga sessions? Simple! Your Php3,500 worth of purchase from the Under Armour BGC store, inclusive of a Power in Pink (PIP) product, entitles you to a free 2-class pass. Limited FREE slots are also available via a sign-up at http://www.tripleready.com. Make sure you get that chance to attend the yoga sessions and get the chance to free yourself from stress, sleep better and a shot to live a better life just like what my friends experienced. See you all every Wednesday starting tomorrow until November 25 at the WOW Wednesdays! Cheers! I never thought that an exciting outdoor activity such as the Alviera Christmas Jamboree exists, not until I got to attend the special sneak peek event held just recently by the organizers exclusively for media. The Alviera Christmas Jamboree is said to be a one-of-a-kind outdoor adventure for the whole family. Happening on the 28th until the 29th of November set at the Sandbox outdoor playpark in Porac, Pampanga, the below press release details the exciting activities that the family is set to experience at the jamboree. Read on and check the photos and get convinced as to why this is one adventure that is perfect for the family who is looking forward to usher in the Christmas season in a different but fun manner. Alviera offers a one-of-a-kind Christmas adventure for the whole family with the Christmas Jamboree on November 28 and 29 at Porac, Pampanga. It is a unique Yuletide celebration where you get to camp out under the stars and enjoy day-long arts and crafts workshops, live performances and holiday games. During this weekend, SandBox transforms into a Christmas wonderland with festive workshop tents, life-sized Christmas displays and numerous parols or Pinoy Christmas lanterns lighting up the campsite. Alviera’s majestic 360-degree view of scenic hills and mountains enhance the fantasy setting. Alviera is Ayala Land’s first master planned estate in the north, in partnership with Leonio Land. A 1,100-hectare development, it is inspired by a philosophy of harmonious balance between urban living and nature. Packages to the Alviera Christmas Jamboree come in Day Dasher and Christmas Camper variants. The Day Dasher package, at P1,900 per person, includes roundtrip transportation from Manila to Alviera, free use of SandBox attractions, access to all Christmas Jamboree Day Workshops, passes to the evening entertainment, stage shows and Starlight Cinema outdoor movie theater. The Christmas Camper package at P2,850 per person entitles participants to all Day Dasher inclusions plus overnight campsite stay, access to campsite-exclusive activities, free use of Coleman tents, exclusive use of SandBox in the morning of the second day, a bonfire treat complete with a set grilled dinner and buffet breakfast on Sunday morning. As a family event, the Christmas Jamboree offers special rates for kids at P1,050 for Day Dasher and P1,750 for Christmas Camper for all children 4 feet below. Both packages come with travel insurance, Alviera Camp Bag, and a Christmas Passport that serves as your event journal that contains raffle stubs for exciting prizes. Day Dashers will experience a full day’s worth of activities including arts and crafts activities such as Christmas cookie- making and designing angel souvenirs and parols. Guests can test one’s knowledge on Christmas trivia with Quiz Kringle. Each time they sign up for an activity, they get an entry to the hourly Jamboree raffle. There will also be all-day fun bubble activities with bubble artists. Live entertainment begins at night with the “poi” or fire dancing and a Christmas carol serenade by some of the country’s top chorale groups. Guests can perform onstage during the Merry-oke open mic session, complete with a live brass band. After the Yuletide dinner, astronomy experts will lead constellation-tracking sessions. The “Starlight Cinema” opens from 9:00 p.m. until midnight to feature Christmas movie favorites. Christmas Campers will enjoy the entire Day Dasher offering combined with premium camping activities such as a welcome bonfire with s’mores at the campsite and ukulele jam session while enjoying hot tsokolate served with biscochio. Campers can also learn to play the ukulele during the workshop. A Christmas breakfast buffet awaits them the next morning, as well as Christmas stockings filled with surprise holiday goodies. The Alviera Christmas Jamboree is guaranteed to inspire lasting memories with families and friends. Christmas is a time for giving and for spending time with our loved ones, and this is what a merry Christmas adventure in Alviera is all about. Tickets only are also available for purchase at P1,000 and P1,500 for Day Dasher and Christmas Camper and P500 and P800 for the kids’ rate respectively. For reservations and booking, guests can visit the Travel Factor website at http://travelfactor.org/jamboree. The Alviera Campfest Jamboree is an event presented by Ayala Land and Leonio Land in partnership with Travel Factor, Coleman, Alveo, Avida, Nestle Chuckie, and Business Mirror. This is also brought to you by R.O.X., The North Face, TriNoma, Marquee Mall, Philippine Daily Inquirer, Philippine Star, and Manila Bulletin.